Jyothika had, however, appeared in Mani Ratnam’s production Dumm Dumm Dumm in 2006 which also starred R. Madhavan. Actress Jyothika, who will next be seen in Magalir Mattum, has now signed her next film which will be directed by ace filmmaker Mani Ratnam. This will be the first ever time in her illustrious career that Jyothika will be acting in a film directed by Mani Ratnam. Jyothika had appeared in Mani Ratnam’s production Dumm Dumm Dumm in 2006 which also starred R. Madhavan. Dumm Dumm Dumm was written and directed by Azhagam Perumal and the music was composed by Karthik Raja. 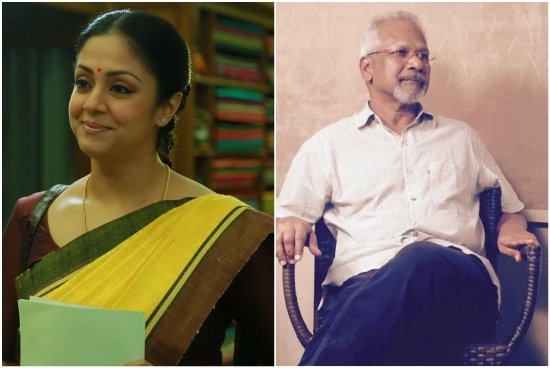 However, this will be the first collaboration of Jyothika and Mani Ratnam as an actor-director duo. This will be most anticipated for film in Tamil cinema and fans will be eager to know more about the film. More details about the film are yet to be revealed by the makers. Messages on social media regarding this combination showed the kind of excitement levels this news has created amongst Tamil movie lovers. After 36 Vayadhinile, Magalir Mattum will be Jyothika’s second movie post her comeback in films. Besides Jyothika, Magalir Mattum also features Bhanu Priya, Urvashi and Saranya Ponvannan. The title of this film was lent from Kamal Haasan who had produced the film in 1994 which starred Revathy, Urvashi, Rohini and Nassar, and was directed by Singeetham Srinivas Rao. Magalir Mattum has Jyothika playing a unique role and is being directed by Bramma. The film is being produced by Jyothika’s husband Suriya himself. Magalir Mattum is being released on September 15th, 2017 worldwide.